Indiana, the 16th most densely populated state, has a colorful character. Indiana boasts immense diversity, beginning with its original habitation by Paleo-Indians as the Ice Age came to a thaw. Climatically, Indiana’s summers are warm but wet, and winters can be cold and quite snowy. Additionally, Indiana tops the list of tornado-prone states. Thus, the boyhood home of Abraham Lincoln isn’t one of the best states for power from solar panels, but the outlook has improved of late. Newer legislature, such as a renewable portfolio standard (RPS), is somewhat encouraging, but state policymakers could do much more to make solar power convenient and affordable. In general, converting to solar panel power in Indiana—anywhere, in fact—is cheaper than it’s ever been. 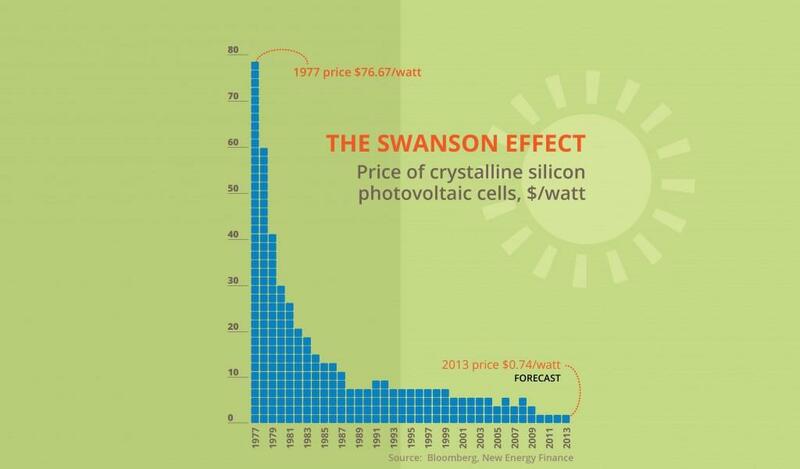 The Swanson Effect graph above demonstrates how solar energy costs have decreased significantly in the past three-plus decades. New technology on the horizon (pun intended) will bring costs down even further. 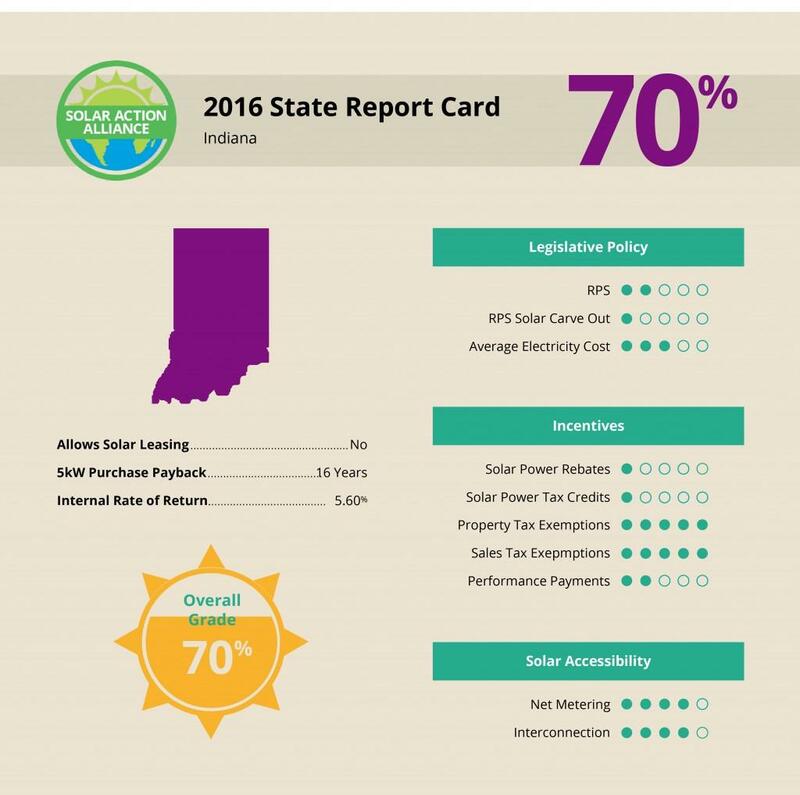 Let’s examine the Hoosier State specifically and see how solar opportunities look now and in the near future. 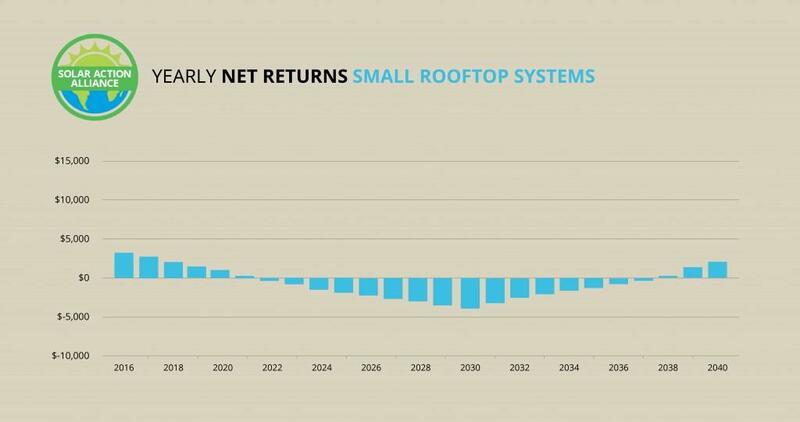 If you look at the graph above, you’ll see the return on investment (ROI) over 25 years for a conversion to solar panels. Note the differences and similarities in the purchasing option and the two loan options. Regardless of the amount of equity you have, there’s a way for you to go solar and still come out ahead in the end. 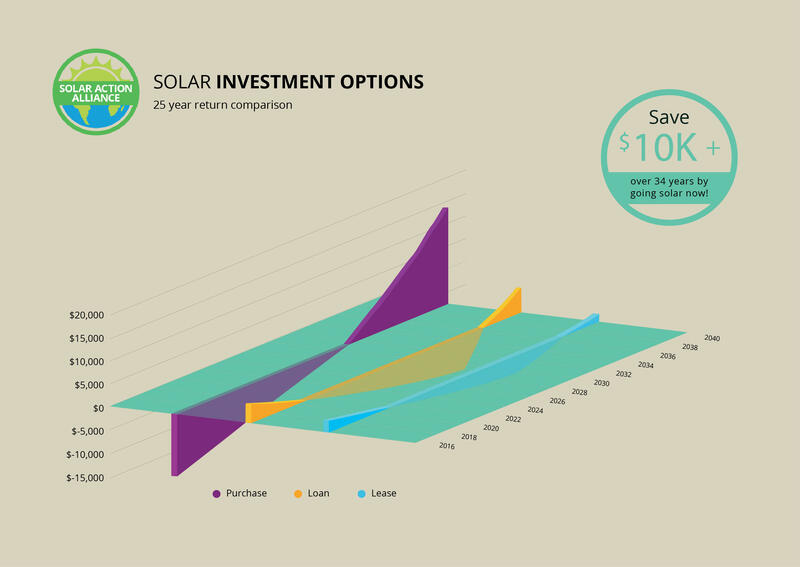 As you might expect, buying a comprehensive solar energy system outright gives you the biggest return, but that’s because you’re shelling out a considerable amount of cash at the outset. 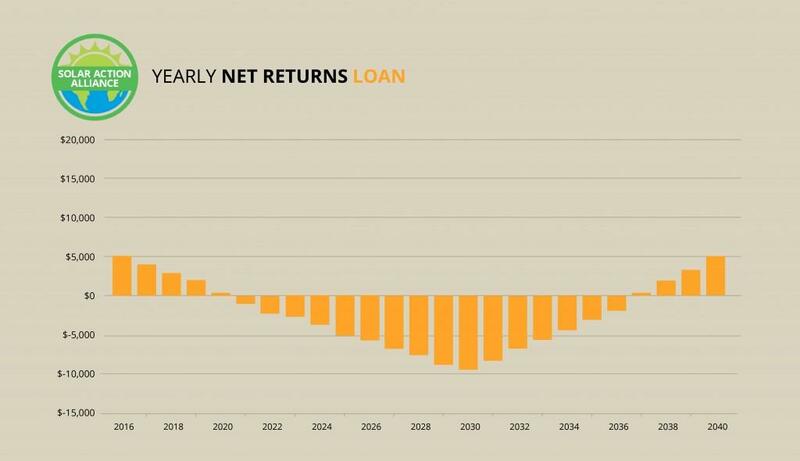 A home equity line of credit (HELOC) will have you paying more cash in the middle of the period, but you’ll still see substantial earnings after 25 years for your solar panels. You can find out more details by reading about each individual option. If you have enough money—at least $20,000—to buy a solar electric system without any help, there’s no logical alternative. An outright purchase means that you own your system, you get a federal tax credit of 30 percent, and you’ll be saving money steadily for the next 25 years. Refer to the graph above for a year-by-year illustration. If you spend $21,000 initially, your tax credit leaves you with a net outlay of about $14,000. Each year thereafter, savings on energy costs will gradually erase the purchase price. 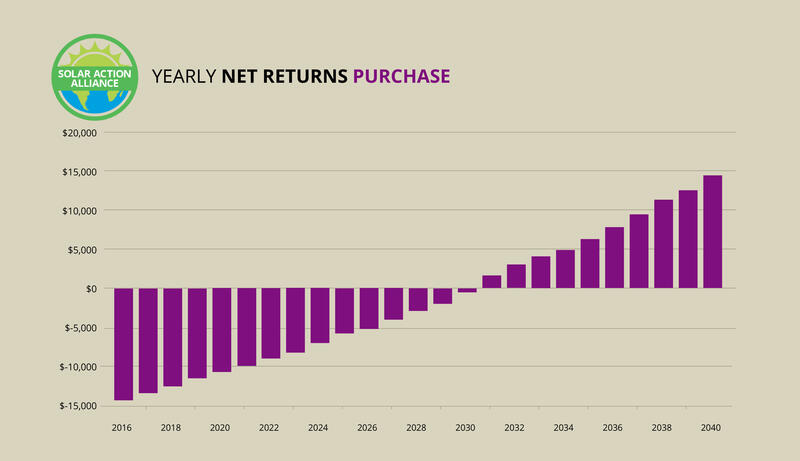 By the end of our theoretical 25-year period, your finances will have done a one-eighty, meaning you’ll have generated 200 percent of your initial investment. Not too shabby, but it’s a bit anemic when you consider what folks in other states make by installing solar panels. Indiana’s low electricity rates and lack of incentives mean you won’t make out like a bandit by harnessing the sun’s rays. Nevertheless, an internal rate of return of 5.6 percent outperforms other investments you could make. In states that have high electricity rates, applying for a loan to get solar panels makes good sense. Even with loan payments and interest, solar owners earn money by saving on utility bills. In Indiana, the news isn’t quite so rosy—but it’s not bleak by any means. Electricity prices in the state are low, so your savings just won’t be as noticeable. Refer to the graph above. When you use a loan to pay for a solar installation, you’ll start out ahead because of the 30 percent federal tax credit you’ll receive. After that, your outgo (between $9,000 and $10,000) will outweigh your income for about the next 15 years. Things will get sunnier for the last decade! Your loan will be paid, your solar panel system will be yours, and you’ll be able to bank the difference between your old and new utility bills. That’s well over $1,000 a year, giving you final earnings of over $5,000. Therefore, if you qualify for a home-equity line of credit (HELOC) to cover the initial installation and a fixed rate of 5 percent or less over 15 years, a loan is still a smart option. If you don’t qualify for a $20,000 line of credit, you might be able to go for a smaller rooftop system that costs about half as much. If you get the same terms as above—5 percent interest and 15 years to pay the money back—you can still enjoy helping the planet out by switching to solar energy. Again, you’ll get a 30 percent federal tax credit the year you install, which of course equals less money, since the system costs less overall. You’ll be spending more than you save for the life of the loan, but then you’ll start earning your money back. At the end of 25 years, having put no money down, you’ll have a small nest egg for yourself or your family. 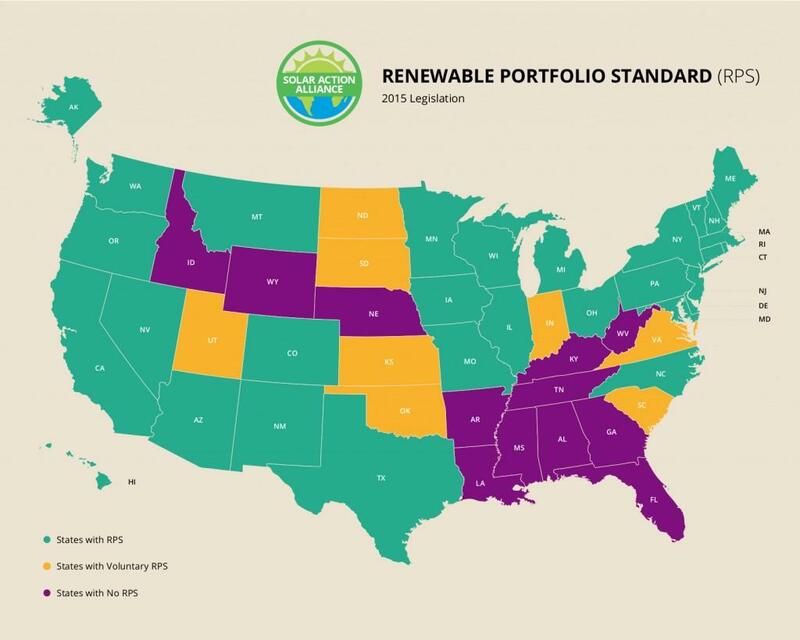 A renewable portfolio standard (RPS) is legislation that forces state utilities to partially transition to clean sources of power, such as solar energy. While Indiana does not have a strong RPS, the state has taken a small step forward. The Comprehensive Hoosier Option to Incentivize Cleaner Energy (CHOICE) program was instituted in 2011. Participation in CHOICE by utility companies is voluntary, and the parameters are low (10 percent clean energy within the next decade), so it’s not changing the world just yet. However, the incentives offered are motivating some utilities to clean up their act. What Indiana needs next is for the RPS to become mandatory. Because even with the incentives, utility companies have little reason to let you generate your own power from solar panels. An actual law would impose penalties on the utilities that don’t meet the standards. This threat would be a bigger motivator. Overall, Indiana gets a grade of “C” for its lukewarm solar panel friendliness. The state has a lot of room for improvement, but that’s not to say that it can’t or won’t happen. Indiana is certainly far ahead of the 17 states that have no RPS at all. Unfortunately, the existing RPS is weak and could use some bolstering if more progress is to be made with regard to solar conversions. Rebate programs and other strategies will do a lot to modernize Indiana.